Our current featured article is titled “Advancing Nursing Science Through Community Advisory Boards: Working Effectively Across Diverse Communities” by Rosa M. Gonzalez-Guarda, PhD, MPH, CPH, RN, FAAN; Emily J. Jones, PhD, RNC-OB; Elizabeth Cohn, PhD, RN; Gordon L. Gillespie, PhD, DNP, RN, CEN, CNE, CPEN, PHCNS-BC, FAEN, FAAN; and Felesia Bowen, PhD, DNP, APN. While this article is featured, you can download it at no cost here. We welcome your comments and ideas! The movement toward community-engaged research is well aligned with nursing’s strong tradition of engaging individuals, families, and communities in designing and evaluating nursing care. As such, nurse scientists should consider engaging the recipients of care in the research process. Community advisory boards are a common way in which communities are engaged in research. 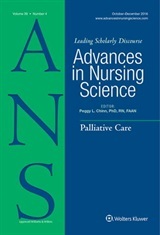 The purpose of this article is to provide a framework for effectively working with community advisory boards in diverse communities that is informed by evidence and experiences of the Robert Wood Johnson Foundation Nurse Faculty Scholars. Recommendations can serve as a blueprint for nurse scientists as they engage communities in research promoting health equity.